The Visual Arts are a key part of the curriculum throughout Moorestown Friends School. In the Lower School art room, the process of creating art is what is considered most important, as students work to develop the fine motor skills needed to prepare a project. There are a variety of opportunities for students to express themselves with many different media available. Art history and curricular themes are often integrated with art projects, helping to make for a well-rounded student. Click here to read about Lower School Community Art Projects. 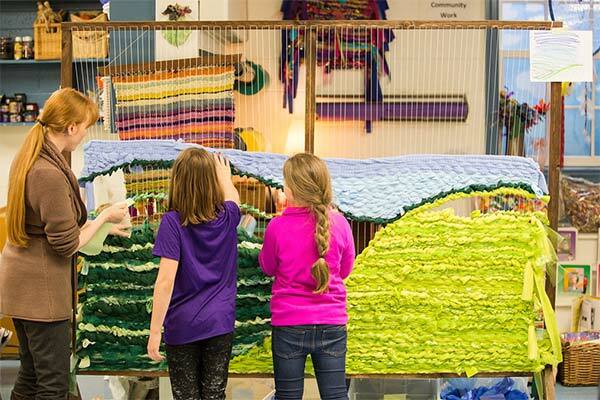 In Middle School, the visual arts are a combination of both process and product. The students work with two-dimensional and three-dimensional art in Grades 6 and 7, using a variety of media such as plaster, slip, and clay to create either masks or relief sculptures. They work in two dimensions with one- and two-point perspective drawings or cooperative griddings. In Grade 8, the focus is on improving drawing skills using exercises from Dr. Betty Edwards’ book Drawing on the Right Side of the Brain, which culminates in a portrait done in pencil. Each Middle School grade level has one day a week of Art History, with lectures and slides introducing them to modern painting styles from Impression through Cubism and Surrealism. There also are trips to the Philadelphia Museum of Art and occasionally to the Museum of Modern Art in New York City to supplement classroom learning. Woodshop is a unique program for Middle School students that gives them the opportunity to work with their hands, to create something, and to see a product that is both functional and physical. In addition to learning about shop safety and shop rules, students gain knowledge of cutting edges (saws, drills, and planes), assembling, finishing, design, and layout. Students complete a variety of challenging projects: fifth graders build prototypes, sixth graders construct containers, and seventh and eighth graders create furniture. In the Upper School, the focus remains on process, but skill-oriented courses also are offered, such as watercolor painting, oil painting, jewelry making, design technology, mosaics, ceramics, photography, sculpture and fiber art. At least six visual art courses are offered concurrently. Juniors and seniors can take Art Studio as a major subject. This course meets daily throughout the entire school year and is designed both for the student who wishes to prepare a portfolio for art school acceptance as well as for young artists who would like to further their skills and appreciation of the visual arts for more personal reasons. Studio artists may also take as a junior AP Studio Art in preparation for submission of an AP portfolio. Trips to either the Museum of Modern Art or the Metropolitan Museum in New York City are taken each year. At the end of the school year, an art show displays for a week the breadth and depth of the projects that have been created by students.